Though more commonly known for its berries, flowering heads from the elderberry tree have been foraged for thousands of years. The flowers have a subtle sweet flavor and delicate aroma. Uses include liquor infusion, ice cream flavoring, syrup flavoring and trail food (just pop it in your mouth). 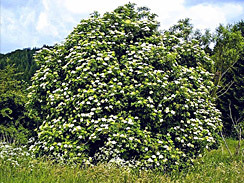 The elderflowers grow in soft tuft-like cluster heads in Spring. These same flowers will later transform into the small dark berries famously used to make elderberry wine. The flowers range in hue from pale buttery yellow to off white. It’s best to harvest edlerflowers in the morning hours while they are open wide. You should also use them within an hour or two of harvesting, as their delicate scent soon begins to fade. 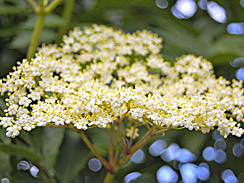 The scent of the elderflower is at least as important as its taste, so don’t delay. The elderberries themselves are often used to make wine, pies, jelly, jam, etc. Though certain elderberry varieties are toxic, the variety that most commonly grows in California, Blue Elderberry, is more or less safe to consume, but only when the berries are fully ripe. Do not eat green or partially unripe berries, as they are somewhat poisonous. 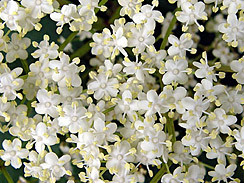 Several days before serving your elderflower martinis, you’ll need to prepare your elderflower syrup. Gently submerge elderflowers in cold water to remove insects and debris. Drain, then stuff firmly into the bottom of a glass jar. Using a fine grater, grate your entire lemon’s surface for zest, place into glass jar. Squeeze juice of same lemon into jar, using a strainer to extract seeds. Combine water and sugar in saucepan, bring to low boil while stirring constantly. When sugar is entirely dissolved, remove from heat. Pour into glass jar, completely covering elderflowers and lemon. TIP: to prevent the hot syrup from cracking your glass jar, either allow to cool or place a lage metal spoon in jar before pouring! Push flowers down firmly to submerge if needed. Add pinch of citric acid. Close jar, and let stand at room temperature for 2-4 days. Finally, remove all solids by straining through cheesecloth into sterilized container. Store in refrigerator or freeze. Now comes time for your martini. Place 2 shots of vodka, 1 shot of elderflower syrup and 8 ice cubes into martini shaker. Put on cap and shake vigorously for at least 30 seconds. Strain into martini glass, garnish with thin sliced lime wedge. Enjoy. This recipe is delicious on salad and in cooking. Pick fully ripe berries, wash, de-stem, and freeze. Freezing makes it MUCH easier to remove the stems. After frozen, remove berries from stems. Be careful to remove as much stem as possible as they can lend a bitter flavor. Smash berries as thoroughly as possible. Place smashed berries and vinegar in container, then cover with cheese cloth. Let the mixture stand for 3-5 days, stirring occasionally. Place in sauce pan, add brown sugar, and simmer for 10 minutes. After cooled, transfer to sterilized glass container for storage. A wine bottle should work nicely. WARNING: Harvesting wild edible plants for human consumption can be dangerous, and should only be done by an experienced knowledgeable forager. Inexperienced folks could become sick or die by consuming the wrong plant. Read full warning.